I’m sure there are better examples of connecting multimedia in pop culture than this line from Beck’s song “Where It’s At” from 1995, but this lyric and the song title speak directly to my current upgrade idea. I think in multimedia. I believe I always have. I suspect many of you do as well and certainly, your children and your students do. Our modern world is creating a new breed of student, all synesthetes, who learn best by involuntarily connecting words, pictures, moving images, and sounds. In terms of modern learning opportunities and upgrades, I think Infographics are “Where It’s At.” Two turntables and a microphone, indeed, as well as a word processor and a camera and software to remix it all together. They’ve been used in advertising and news media for decades and are starting to become a viable instructional strategy in classrooms around the world. The act of creating them addresses multiple standards and the finished product is a demonstration of integrated reading, writing, comparative analysis of text and more, all done in an illustrative and artfully designed way. The brain holds on to that. It’s mental glue. 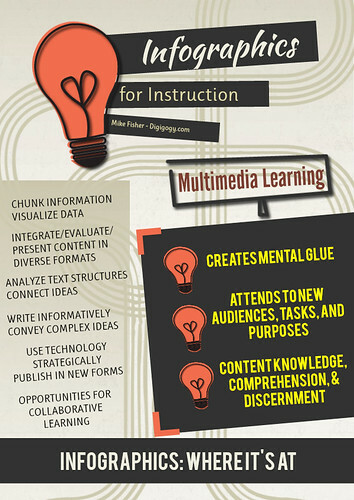 Bill Ferriter’s Awesome Blog Post on creating Infographics without technology! Piktochart - Their tagline is “making information beautiful.” This is a tool that allows the user to design an infographic with hundreds of embedded text and image tools. Smore - Smore is an online flyer app, but the design elements embedded in the application allow for chunking of information and content as well as adding your own content specific visuals. Glogster - While now a paid service (but with a 30 day free trial! ), Glogster is the ultimate Infographic / Online Poster maker. Students could potentially add information, graphic elements, pictures, videos and sounds. It’s a multimedia dream and engages students exactly in the multimodal ways they operate! Infographics Group on Flickr - A group created to share infographics for practically any purpose. Use the search box in the groups page to search for infographics related to the content you are teaching! My Diigo links on Infographics - As I add to this, you’ll have an up to date resources of cool things I find online related to Infographics. LiveBinders Resources - TONS of binders created around using Infographics, many of them specifically for teachers! By the way, in this day and age of modern learning, learning isn’t just about SHOWING what you’ve learned, it’s also about SHARING what you’ve learned. Encourage your students to use the Social Components of some of the Infographic websites. Encourage them to post to the Flickr Group. Encourage them to solicit feedback about their work and then encourage them to upgrade their work. This is AMPLIFIED learning. This is OUT LOUD learning. This is WHERE IT’S AT!